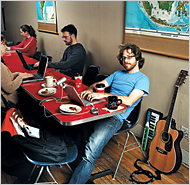 PopSci's official contributing troubadour and podcaster Jonathan Coulton got some major love in the Sunday New York Times Magazine this week as the centerpiece of a story on how musicians are using the Internet to interact directly with their fans in ways that were previously not possible. When he's not interviewing the best and brightest minds of the science world from his PopSci office on the moon or performing at our swanky Future Lounge in Second Life, Jonathan is a full-time, self-supported singer-songwriter. We're all crazy about his tracks here at PopSci (if you haven't heard "Code Monkey" yet, do so at your earliest convenience) and thrilled that Jonathan will probably have an even larger audience to interact with online after this week's piece. You can read the whole thing online here. And after you're done, why not check out Jonathan's PopSci Podcast and our video coverage of this year's Consumer Electronics Show that also featured Mr. Coulton. And last but certainly not least, find out what being a magazine's "contributing troubadour' actually means by checking out Jonathan's five-track digital soundtrack to 2005's Future of the Body Issue called "Our Bodies, Ourselves, Our Cybernetic Arms," still available for a free download. Great stuff.